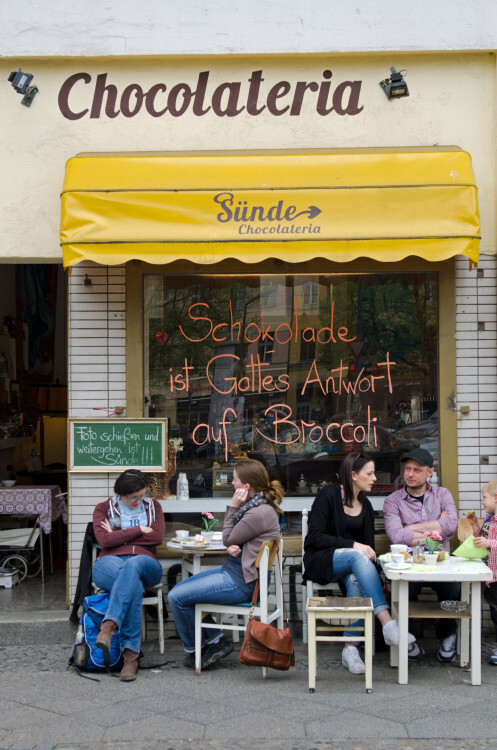 Gritty, hip, cosmopolitan – Berlin is known by many names. Eco-forward and environmentally conscious are also some of them, as Ishay Govender-Ypma discovered. Berlin is going green: Etihad In-flight Magazine, Nov 2015. 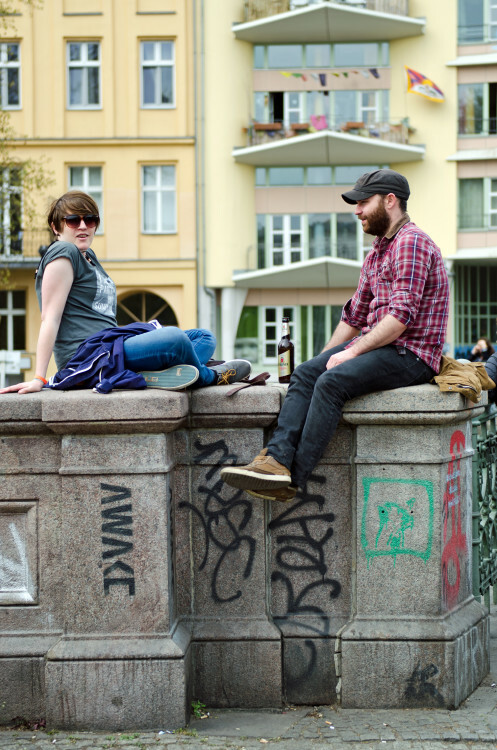 Berlin is known to be cosmopolitan, energetic, gritty and hard-hitting in attitude. It’s also far greener than you may think. While some of its stereotypes still define Berlin’s unique character – the graffiti-sprayed walls, Mohawk-wearing punks and gruff-looking rockers of the Nineties, for instance, there appears to be a collective movement to make urban spaces more liveable, for this and the next generation. With under a million cars, Berlin has the fewest in Germany, thanks to an outstanding public transport system. There’s a marked increase in solar-powered businesses too. The Berlin Goes Green website (www.berlingoesgreen.de) declares that the city houses one of the most amount of green areas compared to others in Europe. Just less than fifty percent of Berlin is comprised of green space or water, an impressive fact considering the number of imposing drab tenement blocks and remaining post-war reminders. 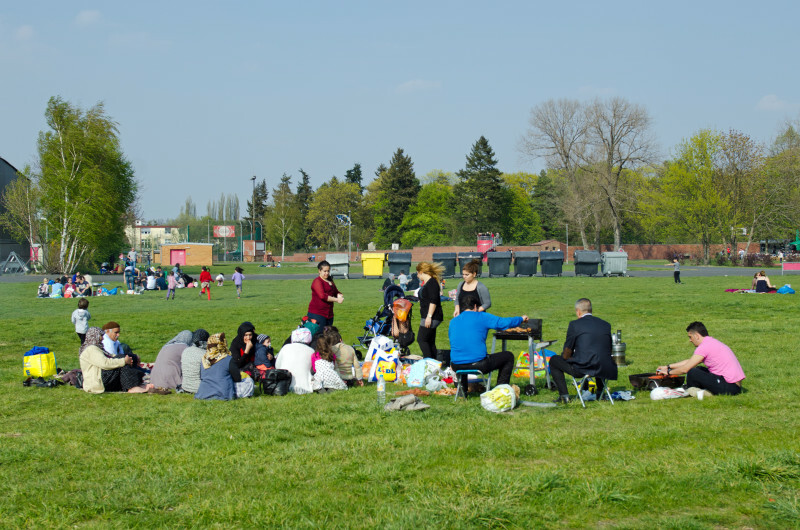 The converted former airport, Templehof, now a sprawling urban park around 300 hectares in size, where families gather for barbeques on the lush grass and runners and bicyclists stretch their limits, is one example of how the public have flexed their “eco” muscles. In spite of attractive plans to turn a portion of the land into affordable housing and businesses, the residents (a whopping 64.3% of them), many of whom live in small apartments, voted in a referendum to keep the park as it is – a public space for enjoyment, relaxation, gardening, festivals and outdoor activities. Politcians and developers were left empty-handed, while Berlin remains more livable as a result. 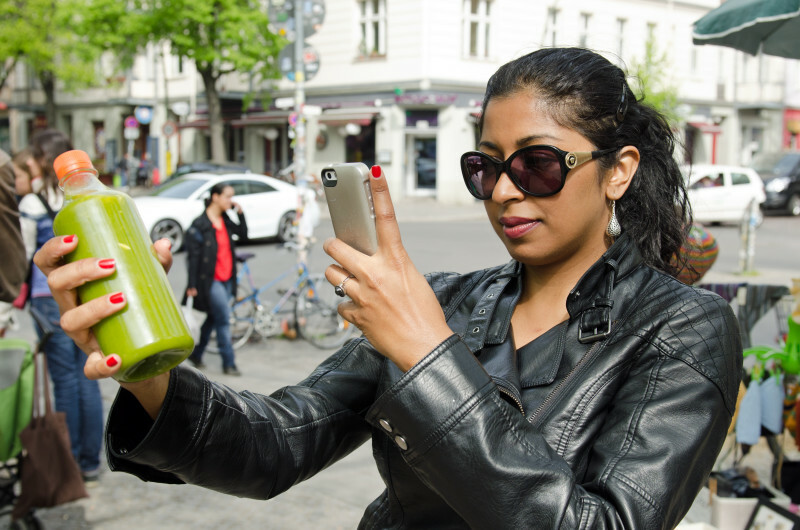 Green Berlin is not one visitors need seek out – Berliners seem to be living it, a message that cramped urban cities can transform to accommodate a safer, greener future. 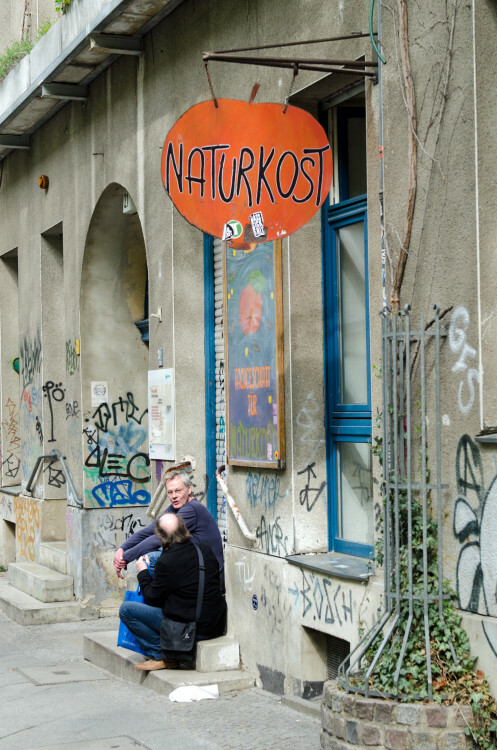 In Kreuzberg, known affectionately as X-berg to locals, a gentrified former West Berlin neighbourhood that was steeped in poverty well up until the Eighties, and is now joined to Friedrichshain, and signs of environmentally sustainable changes are everywhere. 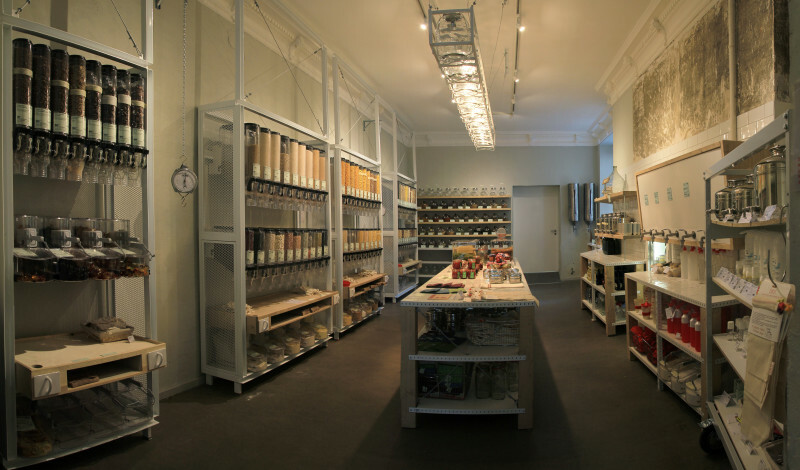 At Original Unverpackt, a packaging-free grocery store, the first in Berlin, and one of a handful across Europe, friends and founders Milena Glimbovski and Sara Wolf have an answer to what they term the “dire state of packaging at supermarket chains.” With backgrounds in marketing, project management and communication strategy, the pair opened the store in September 2014, after a successful crowdfunding campaign to test market interest. Turns out, the market is very interested. Frustrated by the lack of initiative taken by the bigger players in the industry to actively reduce waste in the form of excessive packaging materials, while simultaneously offering an honest product, the duo took it upon themselves to bring the idea to life. A stark and minimalist store, with rows of grains, cereals, fresh produce, detergents, and even shampoo, Original Unverpackt needs some getting used to. Consumers worldwide have grown to depend heavily on attractive packaging and eye-catching, emotive labels with words such as “healthy”, “organic”, “farm-fresh” and “tested”. Countless studies have demonstrated the correlation between advertising on our food (and general) consumptions habits. The concept expects that shoppers know what they’re after, and can see beyond a label. It works like this: customers bring their own containers such old Pringles cans for spaghetti, ice cream tubs for cheese or grains and recycled plastic carrier bags for fruit and vegetables. At the till the weight of the containers is subtracted, and customers pay just for the product. These are the eco-conscious, who probably also purchase fresh produce, armed with recycled shopping bags and baskets from one of Berlin’s several food markets such as Winterfeldtplatz, Boxhagener Platz, Markthalle IX and Kollwitzplatz. A 2012 University of Stuttgart finding shows that German households throw away around 6.7 tons of food a year. Original Unverpackt is, in many ways, a counter to the bulk-buying movement started in the Eighties that resulted in excessive waste and spoiled food. At a store like this you’re encouraged to buy as many or as few items as you need, to take home in your own re-usable containers. Two bananas, one lemon, 200 grams of bread flour? No problem. Wolf says that one of the store’s goals is to “plant the ‘‘unpackaged’’ idea in people’s minds, and one day revolutionise how we go about shopping.” As it is with the choice to purchase fairly traded or organic produce or to eat vegetarian or vegan meals, Wolf adds that purchasing package-free groceries “will become an important criteria” in what it means to exercise environmentally conscious choices. An October 2014 survey on behalf of the German Federal Ministry of Food and Agriculture shows that 78 percent of Germans interviewed “have consciously attempted to avoid producing food waste in recent months or intend to do so.” It adds that 58 percent of respondents interviewed say they want the oppprtunity to buy food based on “conscious, well-informed decisions”. Package-free stores such as Original Unverpackt may just be one of the solutions they’re seeking. www.original-unverpackt.de, 16 Wiener Strasse, Kreuzberg. Have you always dreamt of growing your own vegetables, but the lack of space and know-how has prevented you from pursuing it? Filmmaker Erez Galonska, his partner Osnat Michaeli and brother Guy longed to move away from dependency on supermarkets, to growing their own produce. Living in an apartment with limited space proved a challenge, and they soon realised that if the problem was theirs, it was shared by other city dwellers too. After moving from Tel Avis to Berlin, a city they knew to be open to eco-forward ideas with a population ready to receive them, the trio experimented with hydroponics in their apartment on a small scale. This is a system of growing plants in nutrient-rich water, without soil. The success they had resulted in them taking the idea of a vertical garden to an airstream show trailer in the nearby Prinzessinnengärten or Princess gardens, a privately run project launched in 2009 by Nomadic Green (now a non-profit company). Inspired by visits to Cuba, co-founder of Prinzessinnengärten Robert Shaw, had longed for a city garden, where locals could benefit from growing and tending produce. The garden has since become a community space in a once bombed-out and abandoned site close to where a portion of the Berlin Wall once stood. It houses 500 different plant species including potato and tomato varietals, edible flowers, herbs and vegetables and even bee hives. Run as a centre for learning, and a launchpad for eco-businesses Prinzessinnengärten remains a symbol to Berlin and its green entrepreneurs about the power of community and shared vision. 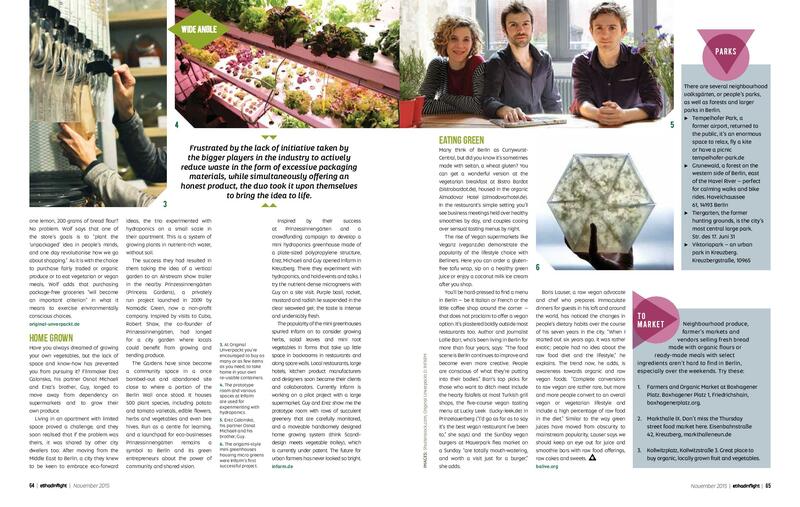 Inspired by their success at Prinzessinnengärten and a subsequent crowdfunding campaign to develop a reusable mini origami-style greenhouse made of a plate-sized polypropylene structure containing clear agar agar gel and microgreens, Erez, Michaeli and Guy opened Infarm in Kreuzberg. 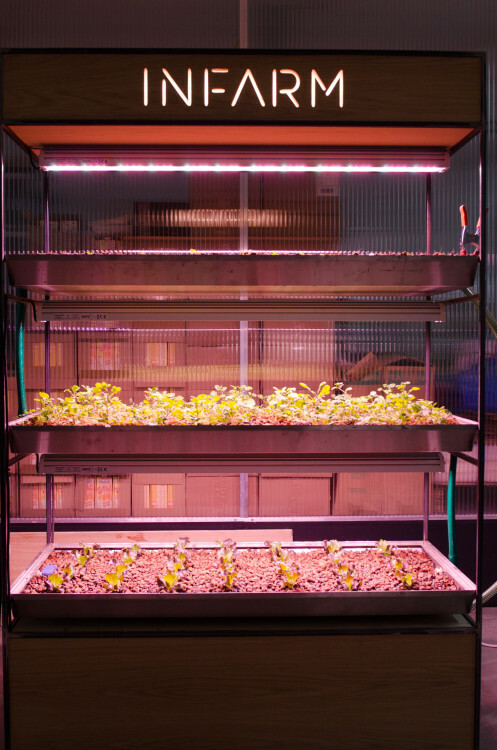 At Infarm they experiment with hydroponics, hold events and talks. I try the nutrient-dense microgreens with Guy on a site visit. Purple basil, rocket, mustard and radish lie suspended the in clear seaweed gel; the taste is intense and undeniably fresh. The popularity of the mini greenhouses spurred Infarm on to consider growing herbs, salad leaves and mini root vegetables in forms that take up little space in backrooms in restaurants and along spare walls, utilising hydroponics. Local restaurants, large hotels, kitchen product manufacturers, and designers soon became their clients and collaborators. Currently Infarm is working on a pilot project with a large supermarket. Guy and Erez show me the prototype room with rows of succulent greenery that are carefully monitored, and a movable handsomely designed home growing system (think Scandi-design meets vegetable trolley) currently under patent. The future for urban farmers has never looked so bright. Many think of Berlin as currywurst-central, but did you know it’s sometimes made with seiten, a wheat gluten? You can get a wonderful version at the vegetarian breakfast buffet at Bistro Bardot (www.bistrobardot.de) at the organic hotel Almodovar Hotel (www.almodovarhotel.de). In the restaurant’s simple setting you’ll spot business meetings over healthy smoothies by day, and couples cooing over sensual tasting menus by night. Vegan supermarkets like Veganz (www.veganz.de, there are a few in the city) demonstrate the popularity of the lifestyle choice with Berliners. Here you can order a gluten-free tofu wrap, sip on a healthy green juice or enjoy a coconut milk ice cream after you shop as well. You’ll be hard-pressed to find a menu in Berlin from Italian and French to the little coffee shop around the corner that does not proclaim to offer a vegan option. It’s plastered boldly outside most restaurants too. 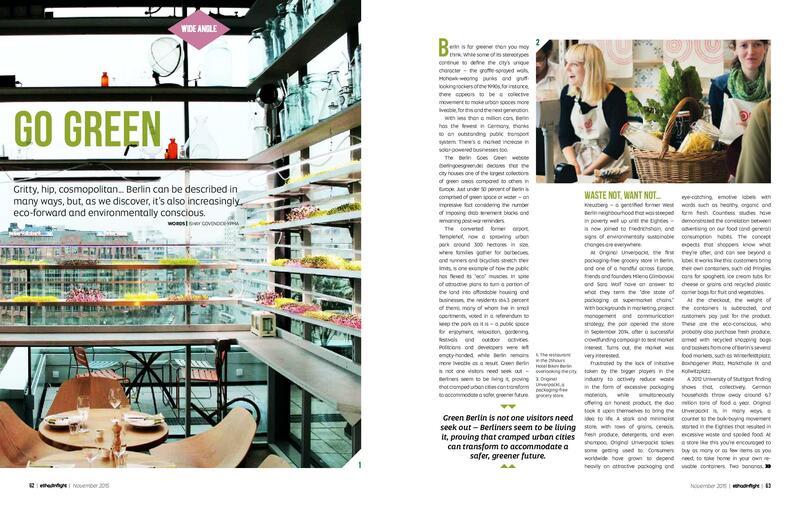 Author and journalist Lollie Barr, who’s been living in Berlin for more than four years, says: ”The food scene is Berlin continues to improve and become even more creative. People are conscious of what they’re putting into their bodies.” Barr’s top picks for those who want to ditch meat include the hearty falafels at most Turkish grill shops, the five-course vegan tasting menu at Lucky Leak (www.lucky-leek.de) in Prinzelauerberg (“I’d go as far as to say it’s the best vegan restaurant I’ve been to,” she says) and the SunDay vegan burgers at Mauerpark flea market on a Sunday. “They are totally mouth watering, and worth a visit just for a burger,” she adds. Farmers and Organic Market at Boxhagener Platz. Boxhagener Platz 1, Friedrichshain, boxhagenerplatz.org. Kollwitzplatz, Kollwitzstraße 3. 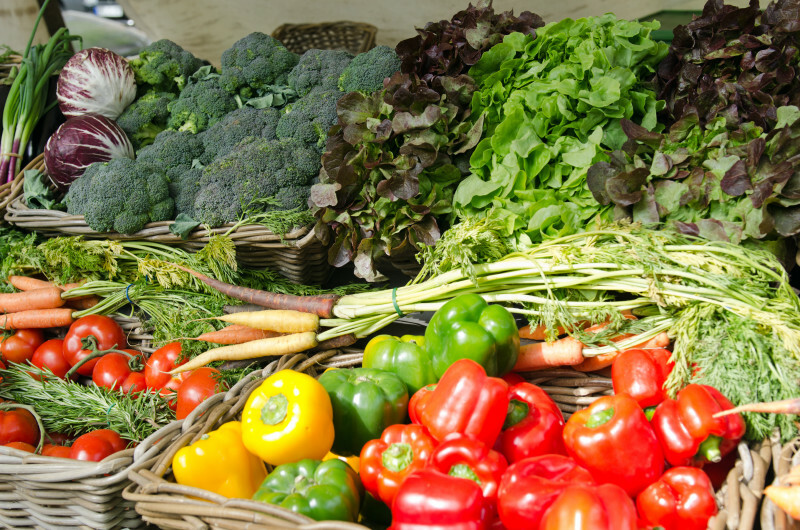 Great place to buy organic, locally grown fruit and vegetables.